DNA, siRNA / miRNA transfection reagent. GeneJect™ is a transfection reagent, which is suitable for the delivery of plasmid DNA and short oligonucleotides, such as siRNAs as well as miRNA mimics and inhibitors. GeneJect™ is less toxic when compared with lipofection. Toxicity is higher at low cell confluency. 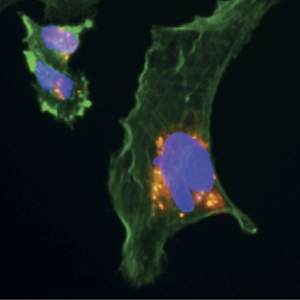 GeneJect™ is efficient in the transfection of common cell lines of different origin, including HeLa, HEK293, PPC-1, HaCaT, A549, BEAS-2B, CCD19Lu, THP-1 and KOP (fetal bovine oropharynx cells). 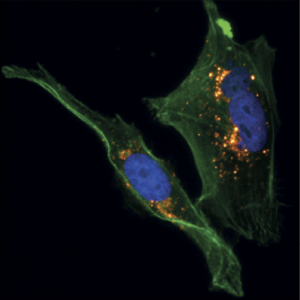 It also enables transfection of low level transfection cells including MDBK (Madin Darby Bovine Kidney cells). 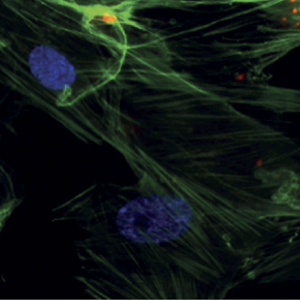 GeneJect™ is efficient in the transfection of wide variety of primary cells, such as human primary keratinocytes, primary skin fibroblasts, melanocytes and monocytes. 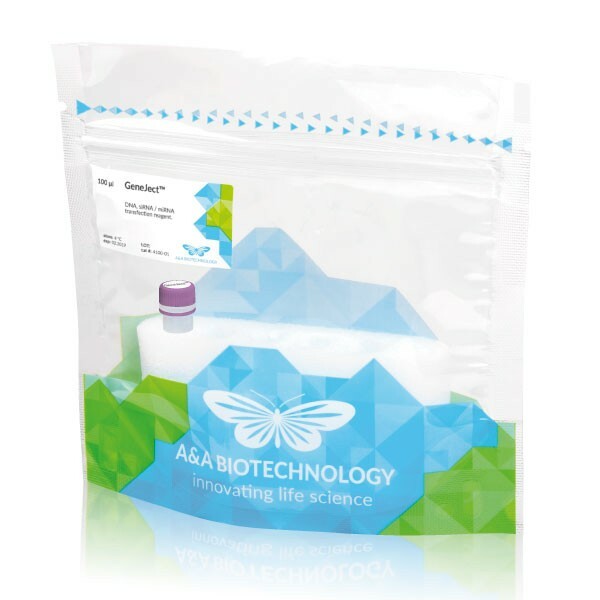 100 μl of GeneJect™ allows for up to 50 transfections in 12-well tissue culture plates format. 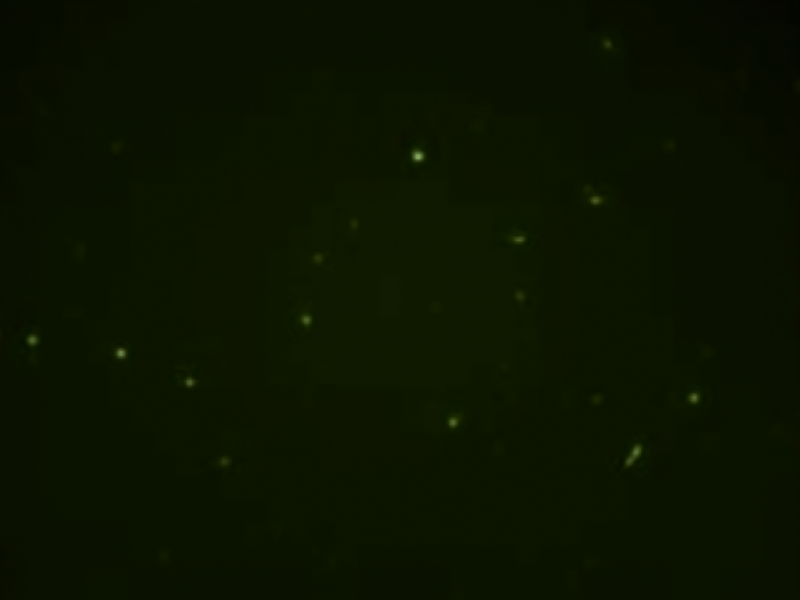 Cells were transfected with pEGFP plasmid DNA on a 12 well plate with 1 μg DNA and 2 μl Gene Ject™ per well and visualised under fluorescence microscope after 24h from transfection. HEK - Easy to transfect Human embryonic kidney cells. MDBK - Hard to transfect Madin Darby bovine kidney cells. 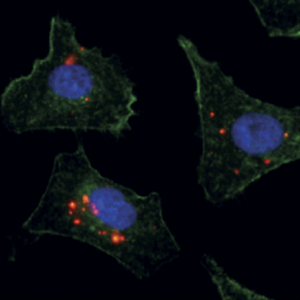 Dy547-labelled (red) miRNA mimics were transfected with either GeneJect™ or with a lipofectamine type of reagent siPORT-NeoFX at 30 nM concentration and stained after 24 h with DAPI (blue) and Alexa Fluor A488 Phalloidin (green). 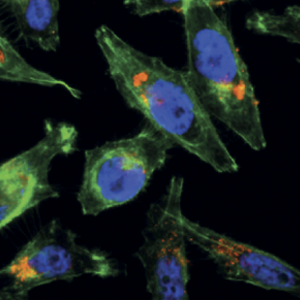 A549 - Adenocarcinomic human alveolar basal epithelial cells, BEAS-2B - Human bronchial epithelial cell line, CCD19-Lu - Human lung fibroblast cells, PPC-1 - human prostatic cell line. 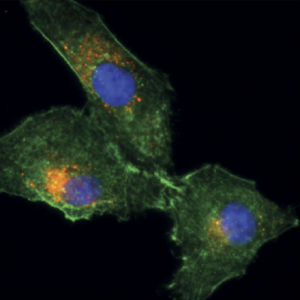 Cells were transfected either with control (cont) or miR-146a mimics at 30 nM concentration. After 48 hours, a total RNA was purified and analyzed by RT-qPCR using primers specific to IRAK1. Relative expression compared to cont in each cell type (=1) is shown. Data represent mean ± SEM of four independent transfection. Student’s t-test, ** P < 0.01. 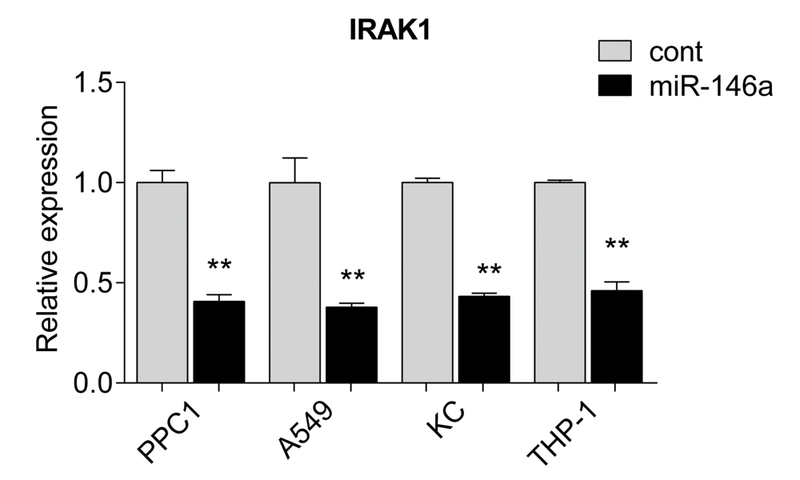 PPC-1 - Human prostatic cell line, A549 - Adenocarcinomic human alveolar basal epithelial cells, KC - Human primary keratinocytes, THP-1 - Human monocytic cell-line. 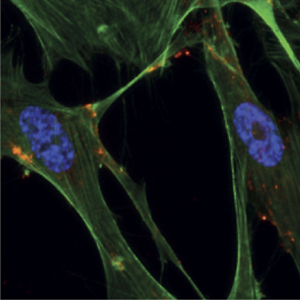 Human primary keratinocytes were transfected either with control (cont) or indicated specific siRNAs at 30 nM concentration using GeneJect™. After 48 hours, a total RNA was purified and analyzed by RT-qPCR using primers specific to IRAK1 and CARD10. 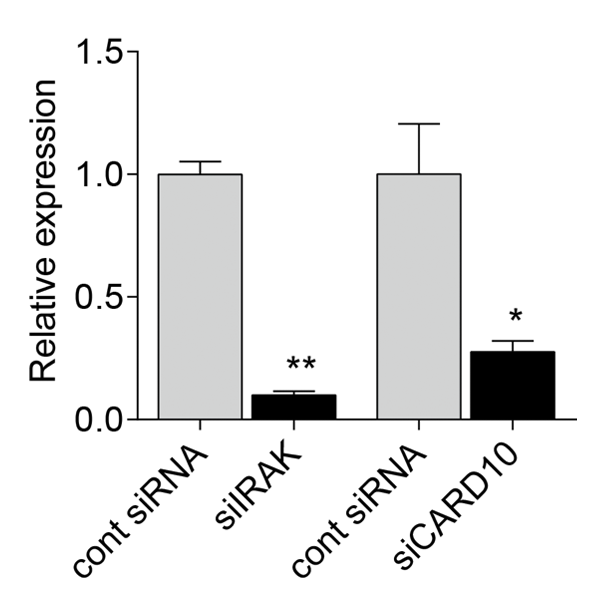 Relative expression compared to cont siRNA (=1) is shown. 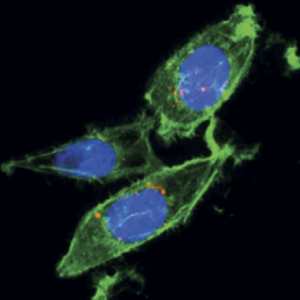 Data represent mean ± SEM of three independent transfection. Student’s t-test, * P < 0.05. ** P < 0.01.